Members who have met the criteria for certification and who have been recommended and approved by the Certification Board of the RPA are listed in our certification registry. Certified Practitioner Members maintain their status by maintaining the recommended CEUs and keeping their member fees up to date. Certified Practitioner Members have a vote at the Annual Meeting and may participate in the leadership and governance of the organization. 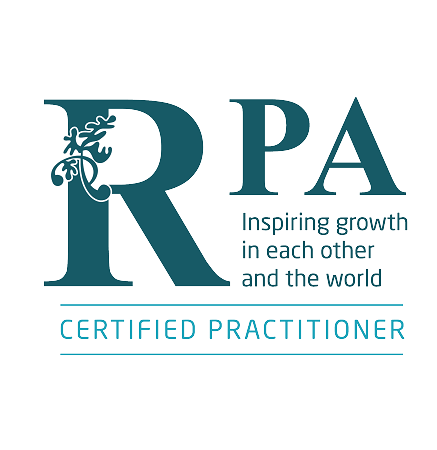 Certified Practitioner Members receive all membership benefits, such as listing their services on the RPA website. Equivalency with another Repatterning Association is provided where we have an agreement. A Certified Member of the Mexican Resonance Repatterning Association, for instance, providing a copy of certificate and verification of current membership standing is accepted. The Code of Ethics has been signed. An annual fee of $200.00 provides continuous access to all members-only content and events, and retains your detailed certification listing online, We do provide a sliding scale and payment plans if needed. Enrolled members are billed automatically 60 days prior to renewal. Continue reading for the Lapsed Certified Practitioner Membership Policy. Payment plans are also available: 2 payments of $100.00 or 4 payments of $50.00. Sorry coupon codes do not apply to payment plans. Members who have met the criteria for certification, have been recommended to the Certification Board of the RPA and have been approved are listed in our certification registry. Certified members maintain their status by taking a recommended 16 hours of CEUs annually and keeping member fees up to date. Members have a vote at the annual meeting, may participate in the leadership and governance of the organization and receive all membership benefits.